The essence of successful antimicrobial chemotherapy lies in selective toxicity of the agent towards the pathogen. An ideal antimicrobial agent should kill pathogens effectively with little or no effect on host cells. There is a dearth of antibiotic and antimicrobial therapies due the rapid development of microbial resistance to these agents, as evidenced by increasing incidences of hospital acquired infections. This challenge necessitates the discovery and development of novel and effective antimicrobial agents. One promising approach is Antimicrobial Peptides (AMPs), which are synthesized by a large number of organisms. The presence of AMPs throughout evolution hints at their importance. The first and foremost interaction between AMPs and target cell occurs at the membrane of the pathogen. The details about these interactions will pave way for the development of new synthetic analogues or modified analogues of existing AMPs. Mechanistic insights into adoption of different structures in presence of bacterial membranes (and with their specific targets) will enhance our understanding and knowledge about these agents and their detailed mechanism of action. AMPs interact with lipids and form lipid-AMP complexes that create AMP-lined ion channels, which in turn modulate the membrane potential. This may have an effect on various biological processes leading to arrest of cell growth or cell death. 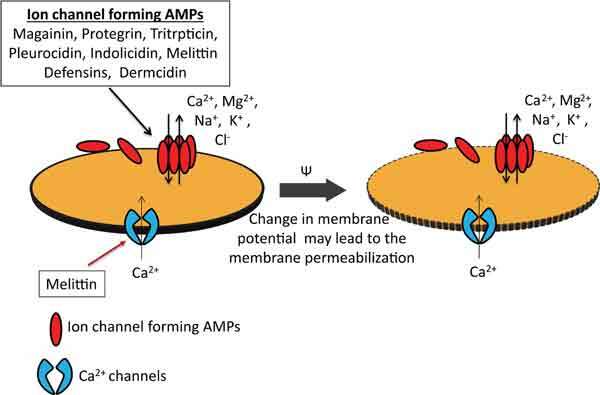 This review summarizes the ion channel formation property of AMPs as an effective approach in dealing with neutralization of pathogenic microbes. Antimicrobial peptides, Ion channels, Indolocidin, Magainin, Pathogen killing. Department of Biophysics, Bose Institute, P-1/12 CIT Scheme VII (M), Kolkata 700054 India.